Find everything you need for your participation in the PREMIUM programme! Consult the student manual, download documents you need, keep an eye on upcoming events and deadlines, sign up for workshops, and contact the PREMIUM Central Management Team. From the online coaching tests to forms you need for coaching and teamwork, reimbursement forms, to the PDP format and other necessities. Read up on the different projects we are offering this year in PREMIUM. 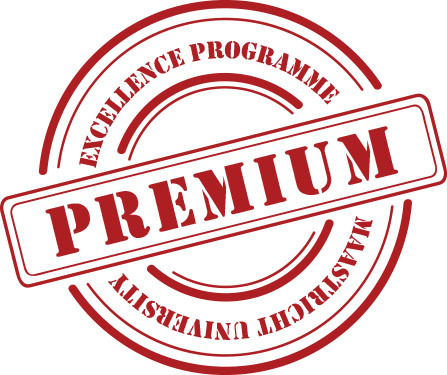 find everything you need to successfully complete the PREMIUM programme! Your opinion matters to us. It helps to improve our PREMIUM programme for the future. More information & sign up! More info about the Events in PREMIUM. Make sure to check the PREMIUM Student Handbook to inform yourself about all mandatory programme elements of PREMIUM. Complete the Kick-Off evaluation form online. Schedule your first team meeting to complete the team charter. Complete the individual section of the team charter and bring it with you to the team meeting. Complete the rest of team charter together. 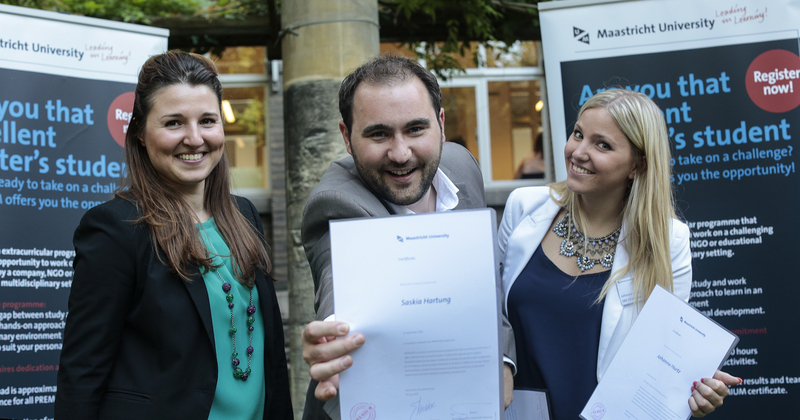 Send the completed team charter to a) your coach and b) to premium@maastrichtuniversity.nl. Reflect on the team charter in your PDP. Pick up the assignment at EDLAB (please inform us when you’re coming in). Complete the assignment (should take approximately 3 hours). You may reserve a room at EDLAB if we have one available (contact PREMIUM Central Management Team). Hand in the assignment at EDLAB. Reflect on the assignment in your PDP. Set up a preliminary budget describing the costs you expect to make throughout the project. Send a copy of your preliminary budget to your project mentor (and client in case of travelling costs) for approval. Assign one team member to email the approved preliminary budget to premium@maastrichtuniversity.nl, with your mentor in the CC. Once you have set up the name for the blog, send the name and link to premium@maastrichtuniversity.nl. Complete the Belbin Team Roles Test through here. Complete the Big Five Personality Test through here. Complete the DISS Personality Test through here. Reflect on your test results in your PDP. Ready? Set? Go! Workshop "Discover your Competences"
Sign up for the workshop “Discover your Competences’ through here. Complete the mandatory homework assignments (found here), prior to attending. Attend the workshop and bring the homework assignments with you. Reflect on the workshop in your PDP. Evaluate the workshop through here. Schedule your first meeting with your coach. Attend the meeting and bring all recently made entries to your PDP with you, including: 1) the results of your online tests, 2) your homework assignments for the workshop “Discover your Competences”, 3) your reflection on the workshop “Discover your Competences”, 4) your personal team charter and final team charter, 5) your reflection on other workshops you already attended. Reflect on this first coach meeting in your PDP. Attend the workshop “Teamwork & Communication” (sign up here). Reflect on the workshop “Teamwork & Communication” in your PDP. Complete the workshop evaluation form on www.edlab.nl/premium. Attend the workshop “Project-Based Working” (sign up here). Reflect on the workshop “Project-Based Working” in your PDP. Keep an eye on your student e-mail for more information concerning the Midterm Presentations and check its section online. Read the section on the Midterm Presentation in the online student handbook. Send in your Powerpoint presentation before the deadline. Attend the Midterm Presentation Session your team is assigned to. Reflect on the Midterm Presentations in your PDP. Complete the Midterm Presentations evaluation form on www.edlab.nl/premium. Schedule your reflective practitioner meeting with your mentor. Fill out the reflective practitioner self-assessment form (individual and team part), and send it to your mentor before the meeting. Fill out the 360 feedback form and send it to your mentor before the actual meeting. Reflect on the meeting in your PDP. Schedule your second meeting with your coach. Attend the meeting and bring all completed components of your PDP with you. Reflect on the coach meeting in your PDP. Together with your teammates and coach, schedule this meeting. Sign up for three more workshops of your choosing, through here. Reflect on these workshops in your PDP. Complete for each workshop the evaluation form on www.edlab.nl/premium. Schedule your third meeting with your coach. Schedule and prepare a closing session with the client together with your project mentor. Fill out the reflective practitioner self-assessment form concerning the second half of your project, and send it to your mentor prior to this event. Reflect on this closing session in your PDP. Keep an eye on your student email, the website and PREMIUM Facebook page for more news concerning the PREMIUM Closing Event. Attend the Closing Event on May 29th. Complete the Closing Event evaluation form on www.edlab.nl/premium. Closing Event, Wednesday May 29th. Email your final report, product, or other form of project outcome to premium@maastrichtuniversity.nl, before the day of the PREMIUM Closing Event. Complete the PREMIUM overall programme evaluation form on www.edlab.nl/premium. Together with your team, set up the finalized budget that describes expenses your team made throughout PREMIUM. Notify your mentor and client ask them to approve the budget. Assign one team member to email the finalized budget to premium@maastrichtuniversity.nl. Hand in the original (no scans/copies) reimbursement forms and receipts to PREMIUM Central Management Team, if applicable and according to all the rules. You can schedule a meeting with Central Management to check if you have filled out the forms correctly. These PREMIUM deadlines are currently passed due. I have a question for the PREMIUM Central Management Team. Before emailing us, please consult the student handbook and the FAQ page or contact your mentor, coach or ask a fellow PREMIUM student.